In the next sizzling installment of K.M. 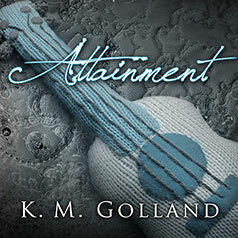 Golland's Temptation series, as Bryce and Alexis prepare to become parents, his past comes back to haunt him. Contains mature themes. For most of Bryce Clark's adult life, he had been plagued by guilt over what he claimed was a wrong decision; a lapse of better judgement on his part. He hadn't lived the life he wanted to live, or thought he deserved—until Alexis came along. Alexis Summers—a breath of fresh air, blown in for Bryce to inhale, allowing him to once again breathe; and live. She ensnared his heart, mind, body, and soul. She consumed him, completely. Inseparable from the moment they first met, Bryce and Alexis are now engaged and expecting a baby. Bryce has everything he has ever wanted; wealth, the girl, and to become a father. Will he finally achieve his ultimate attainment? Or will guilt of what he deems are his mistakes—his sins—ruin everything?